Living in Texas, we’ve seen our fair share of cacti. So it goes without saying that we were intrigued to hear of the Urban Cactus, an architectural project in Rotterdam. Designed by UCX Architects, the future housing project will accommodate 98 residential units within its 19 floors. Because it sits on a harbor, the architects decided that the tower needed a natural “green” image – which has manifested itself in a stacked set of rotated, swoopy plates. The units all seem to have been given an enormous amount of exterior terrace/garden space due to the funky alternating forms. This also affords greater angles of natural sunlight to penetrate into the interior of the units themselves – something which we’re sure is greatly appreciated in the northern climate. We aren’t exactly sure why this thing has been given the moniker of “Urban Cactus”, being only somehwat spiny (and not at all prickly) but its biological undulations and draping gardens offer some refreshing curves to the all-too prevalent Dutch box. Unfortunately we weren’t able to translate the Dutch website, so our critique of the project is admittedly uninformed. We were somewhat disappointed not to find evidence of a fabulous water collection/retention system for the project. Daylight and outside spaces are great, especially when it comes to urban housing projects. But with a name like “Urban Cactus,” shouldn’t there be a true relation to the essence of the hardy, self-sufficient nature of succulents? We do like to focus on green architecture here, so if any of you readers can fill us in on whether or not this building has any other eco-friendly features, please fill us in! hey, this looks like the winning project for JVC of marcel wanders, presented in 2002 in guadalajara (mexico)...? "katie Says: December 11th, 2006 at 9:34 pm...I love the large balconies that actually have sunlight, and the idea is amazing. But it looks so ugly on the waterfront!" Katie, Katie, Katie, NO IT DOES NOT LOOK UGLY. Think out of the box will ya! Looks like a place Yoda would live in. i rather live in a freaking colueagh!!! chears. While we are stretching our imagination here about this beautiful, inspiring building, please notice the underneath plane of each balcony...perfectly flat and perfectly dry and perfectly wasted. For you naysayers...big, tall buildings are coming to all bays so you may prefer this more interesting style to the normal. I love the large balconies that actually have sunlight, and the idea is amazing. But it looks so ugly on the waterfront! WOW! Very unique! Love the style and the use of something different than a "box". Great Architecture indeed! Although the bombardment of the city core in May 1940 wa of course a terrible thing, the positive spin-off was that there was a tremendous empty space createdwhere Architects and Engineers could get rid of their ideas, dreams and sometimes nightmares. Personally, as an "oud-Rotterdammer", living in BC, Canada as a retired Architectural contract administrator I love it. I am probably heavily biased, but whatever the reality of the project (critisism or praise), somebody dared to realize a ("crazy?") idea. We need that more! Interesting yes, and very organic...but then again, so are weeds. What happens when the gardens are not maintained? What is the transport system for plumbing? this building is inspired from a statue by the sculptor Richie. That statue is exposed at Vence in France. Much smaller but exactly the same. The architects have plagiarized the artist. Shame on them. Nice idea, but seems to be a variation on the theme of a highrise block of flats. What an eyesore this building is in the boat basin. Great idea and concept. Elegant design. In terms of practicality, the balconies are public spaces, especially the lowest balconies. Yes to the water and energy and self-sustenance issues. Hey Maidie, the model looks fabulous! Great work! Hope Vestia will build this, so I can live there. I think it is named this because it looks like several of the smaller "living rock" cactuses, some varieties of lithops in particular, which have geometrical whorls stacked verticallyh. beautiful, and very organic in form. Funnily enough it reminded me of the famous Frank Lloyd Wright, funnily because I don't think he has done this though he began very imaginative unusal shapes, and this could fit right in - and then I remembered, it looks like something described by Ayn Rand in Fountainhead, only that was inexpensive housing for poor and this of course is not, not by far. Funnily, also because it should have reminded me of the buildings we spent some years in during late sixties - early seventies, but those were a bit more of a regular long box shape apartments than these, with a T or a Y shape as to buildings, with balconies at the end of each floor alternating direction partially - some had straight and some L shaped balconies - to provide more sun for each balcony. The wonders of CGI! It looks "real" but -- How is the thing plumbed for watering and drainage? It has the appearance of some kind of architectural Chia Pet...Green should be a design element, not a drawn-on mustache.... This is a pseudo-green, "warm and leafy" rendition of an earlier posting on the PreFab listings of a more mechanistic vision, as I recall, rolled off of a flatbed truck. So, How is this any real improvement on that pitch? Really lovely! I live in Rotterdam, so I'm excited these plans exist. I'm not sure when they're gonna build this though, couldn't find any information on that. Overall, I like both the unique style and the large balcony area - as you remarked, great in a northern climate. The significant negative, IMHO, is location -- nothing about the building, either style or height relates to it's surroundings. It is not a question of either enhancing or detracting from neighbours, there is simply no context. That looks amazing! I would love to live there. The website doesn't tell too much about the details of the project and makes no mention as to whether it is eco-friendly. However, thos balcony gardens are very coducive to growing gardens... Very cool. Thanks for posting. Living in Texas, we've seen our fair share of cacti. 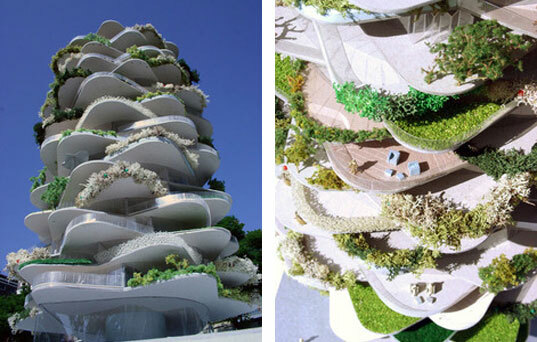 So it goes without saying that we were intrigued to hear of the Urban Cactus, an architectural project in Rotterdam. Designed by UCX Architects, the future housing project will accommodate 98 residential units within its 19 floors. Because it sits on a harbor, the architects decided that the tower needed a natural "green" image – which has manifested itself in a stacked set of rotated, swoopy plates.